Mention ‘afternoon tea’ to me and my ears prick up like a dog that’s just been told he’s going for a walk. I can’t get enough of it. I was a pretty late bloomer when it comes to afternoon tea. I think the very first time I saw someone huddling down for three tiers of sweet and savouries was when I was in Betty’s in York. To my not-yet-teenager eyes (and very under-experienced stomach) the idea of tucking into several courses was inconceivable – how can anyone eat all that much in one go?! But then I had my very first afternoon tea. And I was hooked. I’ve definitely made up for lost time over the years, managing to persuade more than a few friends to catch up with me over afternoon tea at some of London’s best hotels, restaurants and cafes – from Sketch to the Sanderson Hotel, the British Museum and One Aldwych (click on each location to be taken to my review and see what I thought of them!). But, in truth, there’s always been that one place I’ve been dying to go to; the one place I’ve wanted to go to for years, but at the same time been slightly terrified of actually physically going to unless it let me down. 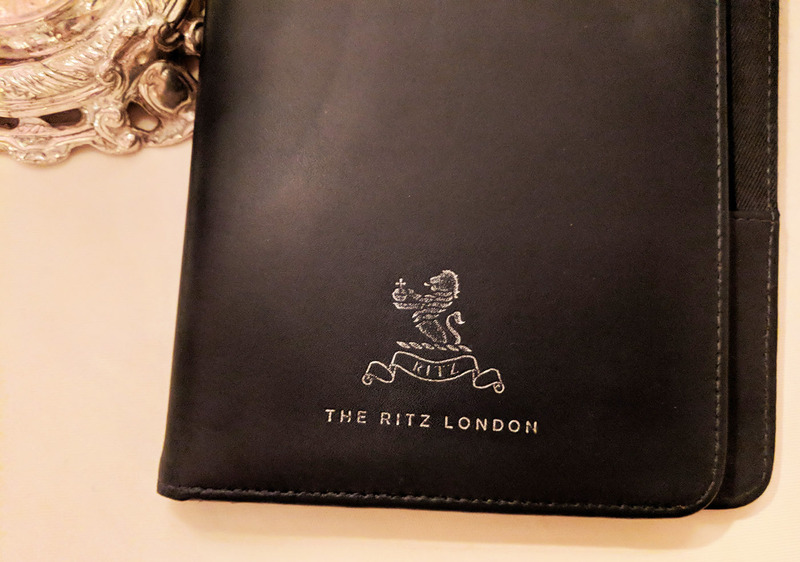 And that’s The Ritz. “Is there where we’re going?” I laughed to Sophie as I pointed at The Ritz’s glitzy front. I gasped. I screamed. In all the excitement, I think I might have actually swore in an elderly woman’s ear. I can’t be too sure. I was stunned. Here I was, dressed up in my poshest dress while attempting to look like I knew how to walk in heels, about to walk into a hotel that epitomises traditional British society. Surely Soph had made a mistake?! But wait. Let’s backtrack for a minute. How could I not know that I was going to The Ritz?! Believe it or not, the entire thing was a complete surprise until just a few minutes before. For my birthday in March, Sophie had given me a few dates to choose from for a ‘special surprise’. 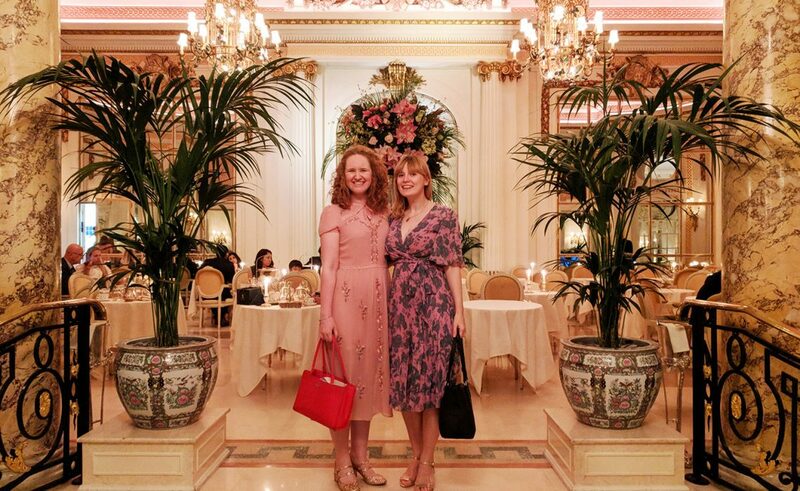 By the time the morning of the day had rolled round, I’d managed to glean a little bit of information from her: namely, that we were going for afternoon tea somewhere posh, and I wasn’t allowed to wear my trainers. 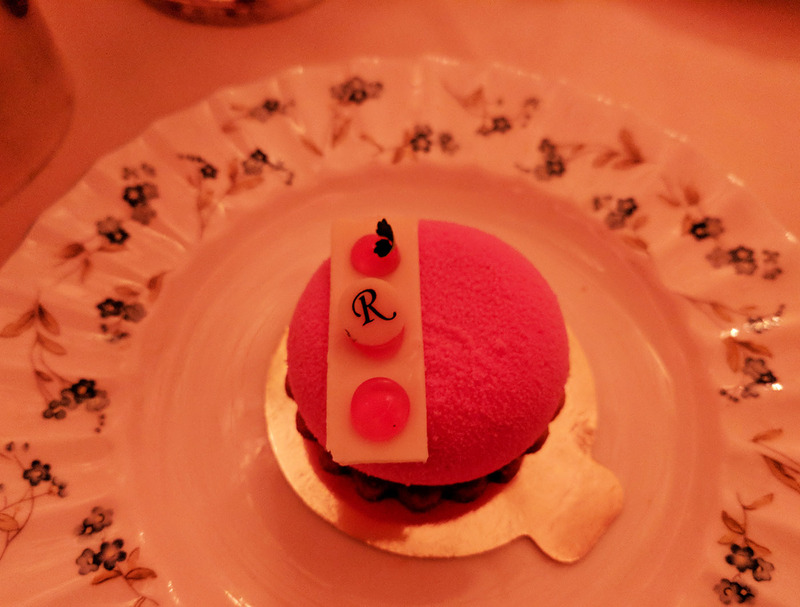 After a little bit of research I’d convinced myself we were going to Fortnum & Masons, so coming face to face with the fact we were going to The actual bloomin’ Ritz (as I shall from henceforth refer to it as), blew me away. It still didn’t feel real as we made our way up the stairs and had the door swiftly opened for us. Would they work out I was just one giant imposter that’s been eating microwaveable rice every lunchtime for the last week?! After getting distracted by every bit of wall, column and inch of fancy carpet, we found ourselves at the dining room for our afternoon tea. Dressed in lavish white and gold furnishings, the room is enhanced by the most intricate of features; every time I looked around I spotted something different! Despite our dawdling, we were a little early so had to wait for a few minutes while the tables were set up. Before long we were shown to our seats where we were in prime position for people watching! The first port of call was choosing a pot of tea to tuck into. The menu features 18 different types of tea, from English Breakfast to Camomile and Oolong, so it was a tough decision to make! In the end I opted for something a little different to my usual – the Ritz Chai. I didn’t have to wait too long before my loose-leaf tea arrived in its sturdy silver teapot. Therein started a few hours of confusion: do I pour the tea myself? Do I have to wait for someone to come and pour it? Why was I making this so bloomin’ difficult though?? In the end, I helped myself to tea whenever I needed it, but whenever a waiter passed and saw my cup was running low, he would fill it up for me as well. Genuinely felt like I was being force-fed tea. It was incredible. Now onto the food! 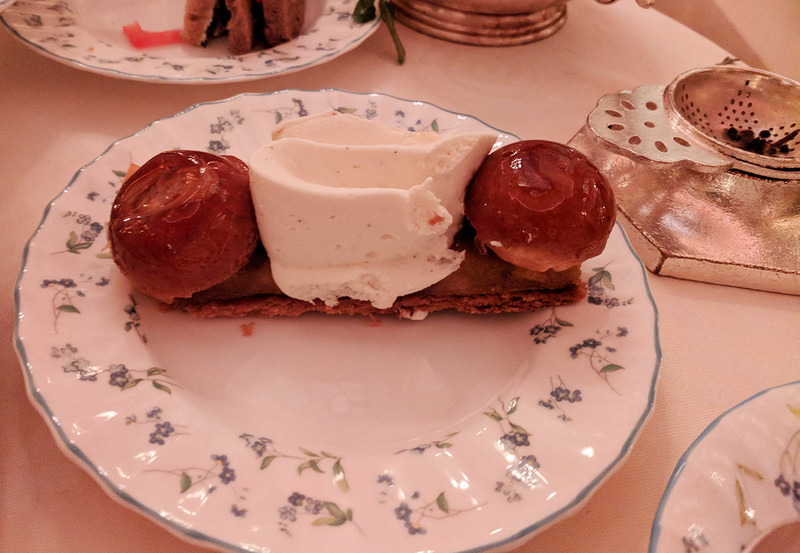 As a vegetarian, I’m pleased to report that The Ritz’s afternoon tea has nailed the traditional and delicious but also without meat side of things. I definitely favour my savouries over sweets, so absolutely adored the different fillings, ranging from cream cheese and cucumber, to hummus, cheese and apple chutney, plus tomatoes. We had eight sandwich fingers each, and then they brought out another four. Mistake number 1: eating all the savouries that were shoved under my nose. After we’d finally waded out of the sandwich tier, we turned our attention to the sweets. With two small scones (one plain, one with currants) each, we wolfed these down in seconds – smothered in cream and raspberry jam, of course. And then attention turned to the miniature cakes. By this time we were full, but we gave it our best shot. 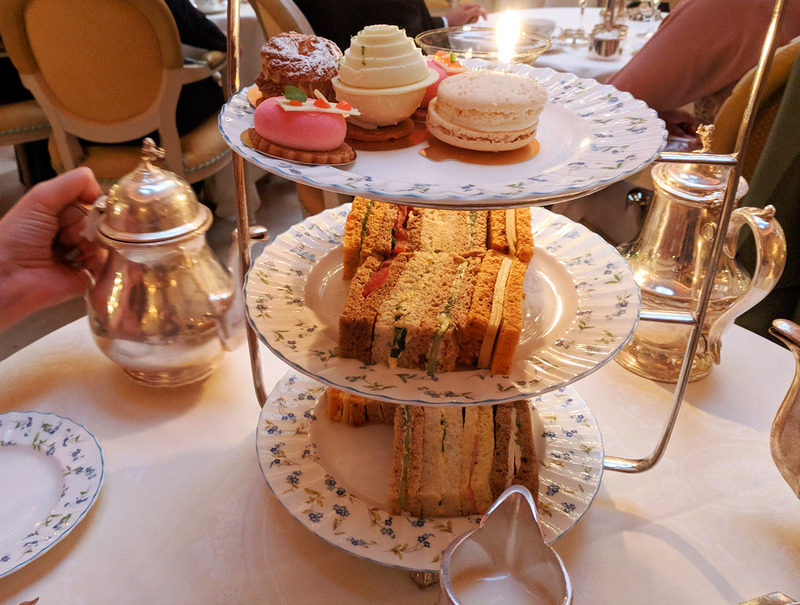 My only slight pet peeve about afternoon tea is when they don’t give two of everything – we got round this by cutting everything in half so that we got the best of both worlds. My absolute favourite was the beige icing sugar-topped cake on the far left, but even then I only managed one bite as I was so full! By the time our waiter came round to ask us if everything was OK, we had to beg him not to bring us any more food as we were completely stuffed! Luckily he saw the funny side of it and I think he even took a bit of a liking to us – before we left he gifted us a menu each as a souvenir, plus a pen and a postcard! Pretty sure these are the fanciest things in my entire flat now. 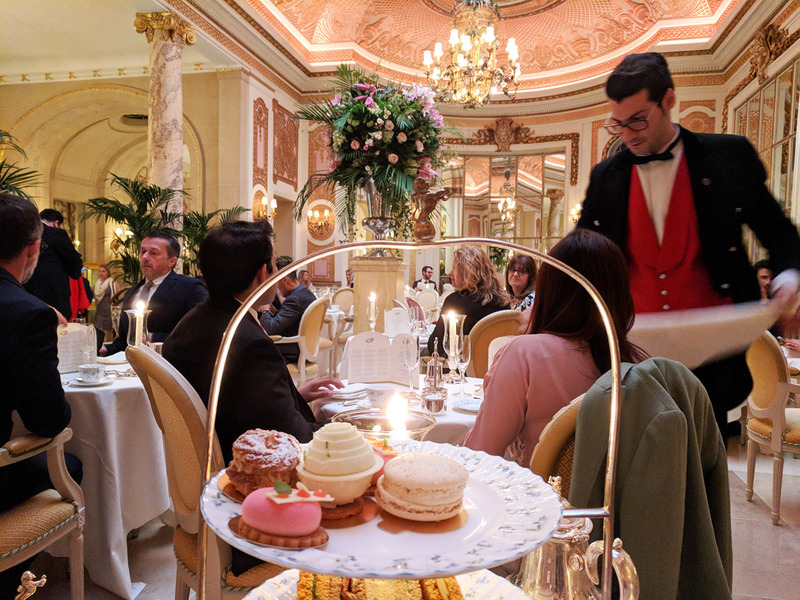 They say to never meet your heroes, but boy am I glad I met afternoon tea at The Ritz. It was the right blend of everything: a relaxing ambience, combined with solid (and not too over-creative!) flavourings, and efficient staff who couldn’t do enough to make our evening the best it could possibly be. 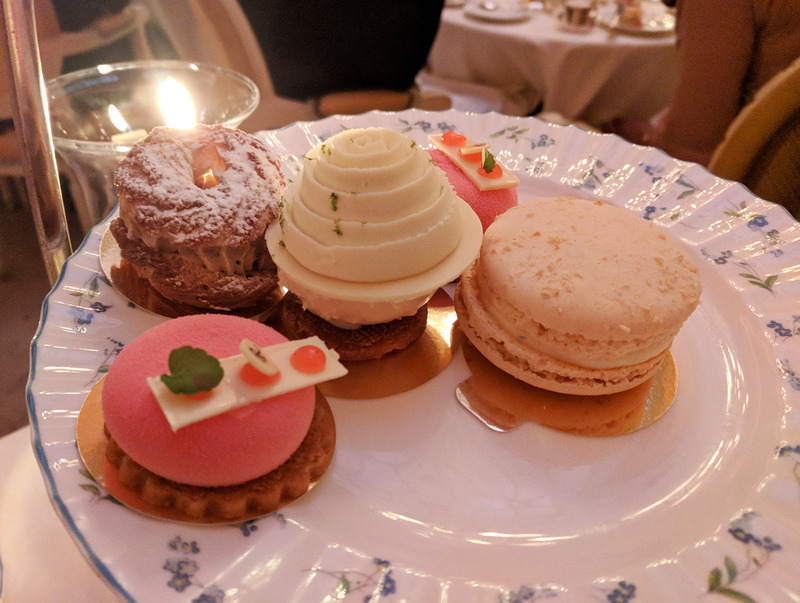 I love the fact that afternoon tea isn’t strictly an afternoon affair either; for instance, we popped in for ours at 7:30pm on a Sunday night, and I barely had to eat anything until Tuesday morning. It was that filling! 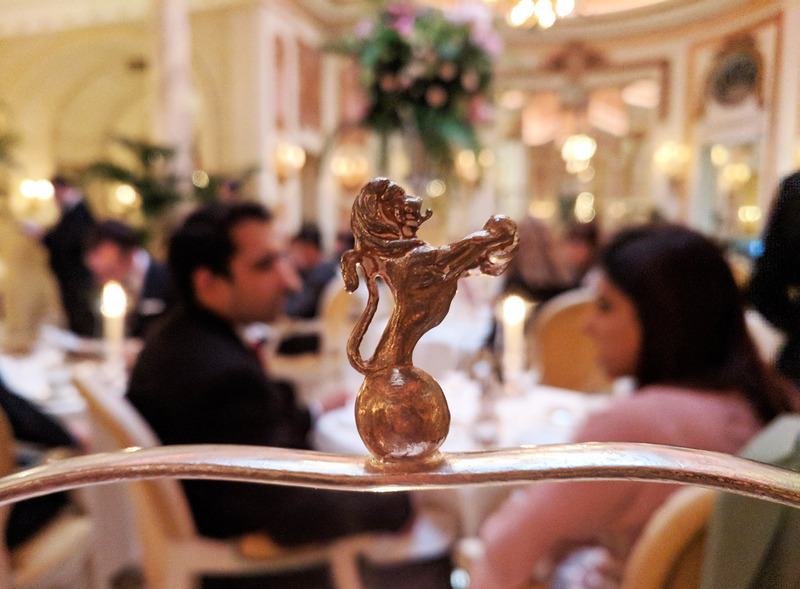 Put simply, The Ritz is hands down my #1 choice for a traditional afternoon tea in London. Go, go, go. And take me with you. 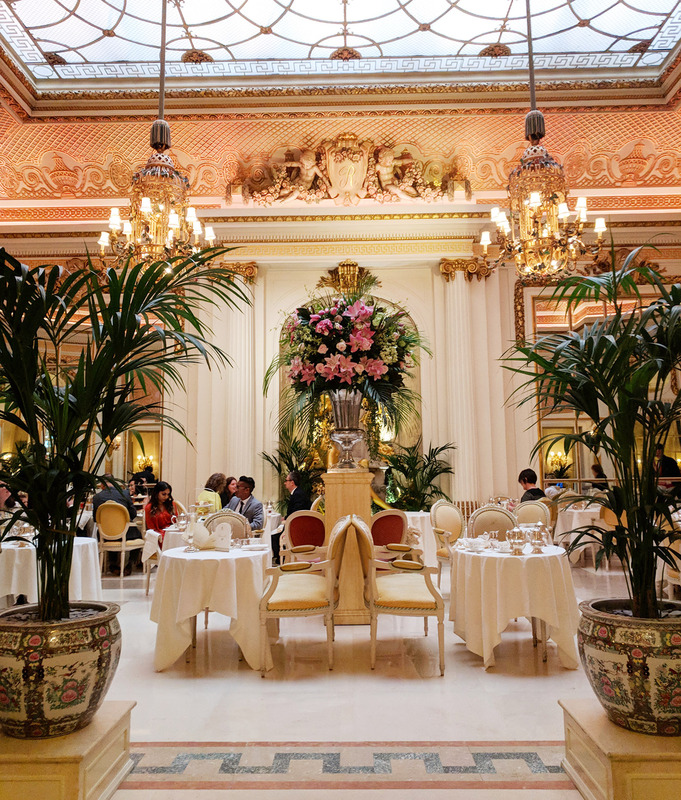 Where’s the best place you’ve had afternoon tea? Is there anywhere else I should try in London? Wow, what an absolute dream!